Campus House, Buffalo State’s teaching laboratory for tourism and hospitality majors, closed its doors for the fall semester on December 13. Kathleen O’Brien, director of the facility, has promised a new a la carte menu when Campus House reopens for dining on February 3. Following a $1.5 million renovation, Campus House opened its doors to members in fall 2002. The building, one of the five original buildings at Buffalo State’s Elmwood Avenue location, was designed as a home for the college’s president. Following its renovation, it started a new life as a space where students could master the fine points of managing a high-end restaurant. “More than 1,000 students have received specialized training in hospitality here,” said O’Brien. 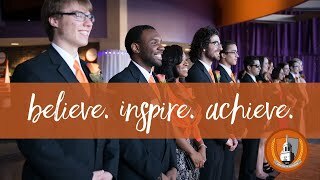 “From the back of the house operations to the front, students learn how to put theories of hospitality management into practice.” Campus House has a unique synergy that draws on a professional chef, a sommelier, faculty mentors working side by side with students, and members drawn from Buffalo State’s friends, alumni, faculty, and staff. The result is an extraordinary learning experience for students. Members and their guests can enjoy a classy on-campus lunch and after-work networking opportunities. “Classy” includes menu items such as cornmeal-crusted oysters on a classic Caesar salad and Steak Diane Ravioli. Meals are served by students who are becoming fluent in the nuances that make the difference between success and failure in the service industry. Certainly they have succeeded at Campus House, which now has 422 members—an all-time high that represents 11 years of consecutive growth. Guests can make a donation to the student program fund, which provides financial support and enrichment activities for the students. 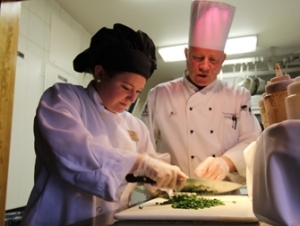 In spring 2013, 18 students traveled to northern Italy for a study-abroad experience that focused primarily on cuisine while introducing students to the world of international hospitality and tourism. The trip was funded largely by the Statler Foundation. Before closing the doors for Campus House for the winter break, O’Brien reminded members of the events to come in the new year. They include a beverage tasting in February, the annual Dublin House in March, and a clam bake in June. For the members of Campus House and their friends, the spring 2014 semester can’t come soon enough.